This piece has transformed like crazy in the last few weeks. Now, the dark red is more pale/bleached, but the green spots are super bright. You can see the green dots all over the place when its just white light. I am hoping the pale part darkens up again. I plan on selling this piece to an SPS lover though. Although its awesome, I really like the movement of LPS. Not sure why I didn't get a notification for this message. Seems as though the forum is on the fritz. Sorry for the delay. The green is visible more and more each day. You can see it clearly with the actinic somewhat without it. I may move it around my frag tank. The only problem is I designed my tank to not hold SPS and I cannot move it higher. Maybe I'll manually adjust one light and see if I can give it more. I just don't want to blast all the lights or my LPS will go AS. 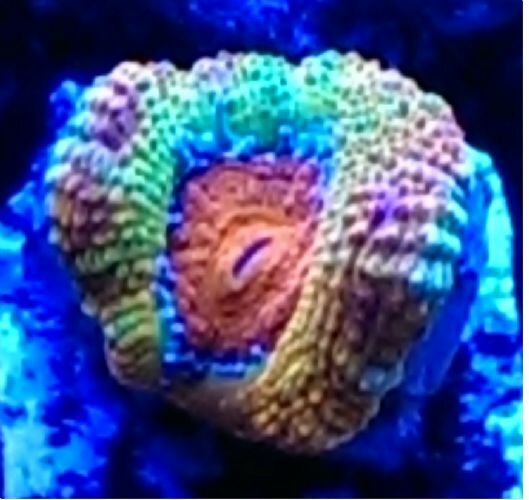 I'm sure this coral has value so I might consider getting rid of it. I want SPS one day but not yet. I really love how LPS move and look. Garff was a company that did corals early in the hobby. Their bonsai is still one of the most popular corals. Can you see the green in person without the blues on? The original garff the green is as bright as gsp green during the day and ridiculous under just blues. It might just need different lighting or placement in the tank to bring it out. This piece only looks really cool under actinic. Its too bad because its beautiful. Okay, this is ironic and annoying as hell. A few days ago I could only take ultra blue, ultra bright looking images. Now, for some reason, I cannot. Below is a super crap pic I just took. You can see a couple of specs of green in the tips. Imagine that, but the whole thing covered in it. It looks like stars. You'd have to see it. Maybe next time Jackie, the photo wizard is around, I will be able to show you Krazie. Jackie, I think you are right. I think the UV lights are burning the hell out of my eyes. I see spots for a few seconds after I work on the tank. Krazie, thats it! I mean, thats what I was told. But if Garff is a person, its impossible to obviously know if its really his. It has green polys when the lights are off. Let me add an image with only blues on. It'll look like crap but you'll see the green. Garff bonsai is similar in structure as well and is a dark reddish purple. The thing missing for me to think it's bonsai is the green polyps. If I remember right seeing this the other day it's more of a burnt red/orange color in person right? Looks more like the red planet. It is a dark red color though. It seems to get darker the longer I have it. If I doesn't start to improve I may need to have it rescued. I did know the name at one point. It's from someone big in Idaho. It's like a Tyree or Jason Fox type person. Something bonsai. Yes lots of polyp extension. Look at red robin Acro as well. It's similar in structure but a deep red burgundy color. Hahaha. I see! But this is pretty red. Does yours have polyp extension? I have another SPS thing that came almost dead and has more extension then the aforementioned piece. Thank you! Googled red planet and I couldn't find anything close to this. At least what it looks like in person. Unless I have Googles most boring colony of red planet. Haha. Some of the results on Google are amazing! It looks a lot like red planet. I have two pieces of it and one branches with only a little encrusting, the other one encrusts a ton and hasn't branched yet. Can someone please help me identify what kind of SPS this is? I'm not very familiar with SPS at all; I took this in on a trade about 1 month ago and am debating fragging it. That said, does anyone know what it is? I found something called a staghorn that looks like it, but this piece also has encrusting parts versus plating or looking like a staghorn like most of it. Sorry, not very well versed in anything SPS. I also think there are two different pieces merging together. One looks dark red with almost no spots. The images are taken under 10K white, but with the actinic lights on, its very red and the little dots pop in a green color. Its cool looking in blue but boring in white.